Yellow Flower Bridge for Gypsy Miniature Fairy Gardens. 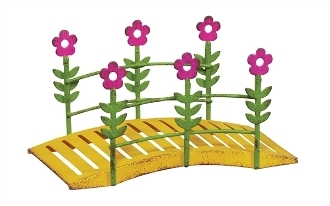 Full Description: Add a bright pop of color to your mini garden with this yellow flower bridge designed by artist Genevieve Gail. Made of metal, it features hand-painted details and all-weather paint.